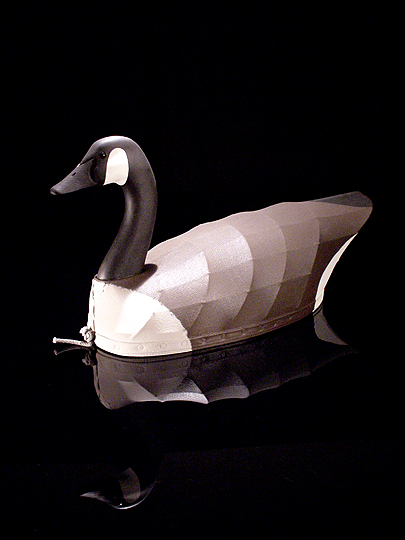 Unlike traditional solid-wood decoys, this decoy uses wood, steel, and canvas to create an effective lure for goose hunters to use to attract geese. The base, neck, and head are solid wood; the body is composed of a framework of steel wire over which canvas is stretched and riveted to the base. The entire assembly is then painted and waterproofed... it will float just as well as a regular decoy, but costs far less to make and weighs a heck of a lot less than a solid piece of wood. I purchased this decoy from Jarvis Snow, of Powells Point, North Carolina (from Kitty Hawk, NC, head north on US 158... his house is about six miles north of the bridge to the mainland, on the right... look for the big "DECOYS" sign). At one time, Jarvis produced and sold his own decoys. However, I am told that he hasn't produced any decoys of his own for years, and merely resells decoys made by others. Jarvis loves to talk with visitors... when I was there, he was also entertaining visitors from Michigan who stopped to buy a decoy from him. At any rate, this is a very nice decoy. I have it sitting on one of my bookshelves.